Alyssa went to japan and got some nail stickers back to sg just cos she thought it looked pretty. So, she came to me with the stickers and ask me to do a set with the stickers she had. 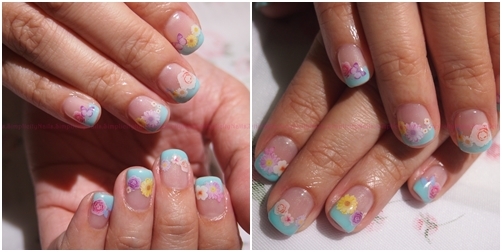 I chose the floral stickers cos I really like the colourful combi. We actually mixed 2 different sticker for this set. Im a girl that looooves anything pretty & sweet.